How do I search for jobs on Naukri? What is Advanced Search? Searching for government jobs on Naukri? How to save a search as an alert? Browsing jobs on Naukri? What are Premium jobs in Naukri? How do I search for jobs on Naukri? 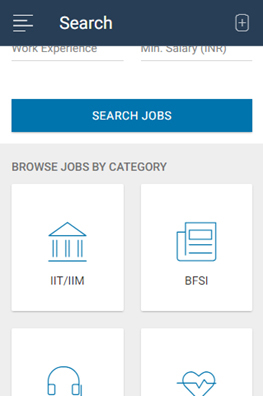 You can search for jobs that have been posted by companies and recruiters on Naukri based on key skills, job title/designation or company names. You can also specify location, minimum work experience and minimum salary expected, before searching. If you get hundreds of jobs, you can narrow down your search by using filters. If you do not want to apply to a job right away, you can save the job and apply later. If we show, “No Results Found” for your search result, we recommend you to broaden the search by reducing your filters and criteria while also checking for spelling mistakes in your query. In the search bar, type a keyskill, job designation or company name. You can also use Boolean search to refine your search query. 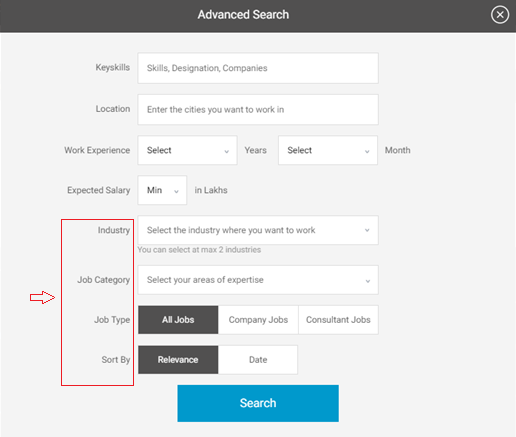 Type the location where you would like to get a job in the location field. Select the work experience in years for which you want to see jobs in the work experience field. Select the minimum salary for which you would like to see jobs. Use filters such as Top Companies, Industry, Salary range, Location, Education, Employer type (posted by company or hiring consultancy), Job Type (International, Premium, Walk-in) and Freshness (how long ago the job was posted) to get more accurate results. These are found on the left side of the search results. You can click the Sort by dropdown at the top of the search results to sort either by relevance or by the date when the job was posted. Click Apply or Apply on Company Website to apply for the job. In the search bar, type a keyskill, job designation or company name. Tap the filter icon at the bottom corner to filter and sort the results. You can sort by relevance or job posted date. You can use filters such as employer type, location, education, industry, salary and job type. Tap a job posting and click Apply or Apply on Company website button to apply to the job. Applying on company website will take you outside Naukri to the company’s website. Advanced search allows you to specify more criteria such as your preferred industry and functional area. You can also specify whether you would like to see a job posted directly by the company or also see jobs posted by a consultancy on behalf of a company. Searching for government jobs on Naukri? Go to the URL “www.naukri.com”. Click on Govt. Jobs tab at the top. Type a keyskill, designation or company name in the search bar. Type location. Tap the hamburger icon at the top left corner of the screen. Select Search Jobs option to go to search page. Type a keyskill, designation or company name in the search bar. Include the word ‘govt’ or ‘sarkari’ in the search query. Example query: “teaching govt” will show you teaching jobs only in government sector. How to save a search as an alert? 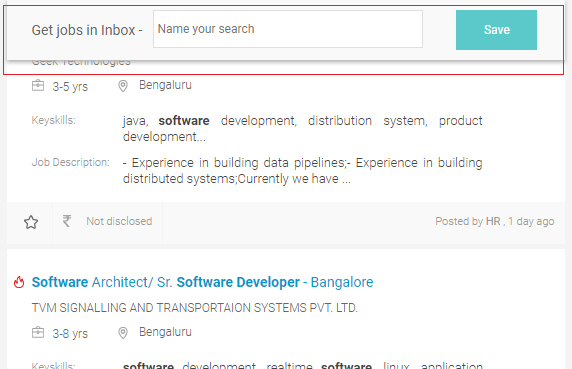 After you search for jobs on Naukri using a search query, you can choose to set the search as an alert. This would ensure that when recruiters post new jobs matching your criteria on Naukri, we will send an email and push notification on your mobile app to keep you updated and make your job search easier. This is especially useful when you have selected many filters to refine your search query. You can use the alert to find matching jobs easily instead of doing the search again from scratch. You can find the alert by clicking on My Naukri and scrolling to the section New Jobs in My Job Alerts. Click on Manage Alerts to view, modify and delete the job alert. If you don’t know exactly what type of job you are searching for, you can browse all the jobs posted on Naukri. What are Premium jobs in Naukri? Premium jobs are those jobs for which the recruiter has shown a preference to hire candidates from top tier institutes of the country. You can identify premium jobs using premium icon next to the job title. Note that premium institutes are not restricted to only IITs and IIMs. You can choose the Functional Area or Industry such as Banking, HR, Marketing, IT etc for MBA jobs and IT, Infra, Telecom etc for engineering jobs to narrow down your search.